I have partnered with Collective Bias and their client, MasterCard to share my experience from this dreamy event. Although, I am compensated for the post, my excitement is all the way for real. The Saks Yeti made it snow on 5th Avenue! I have to hand it to MasterCard and Saks Fifth Avenue. I feel so spoiled. This is the only way I want to do holiday windows from now on! On Monday, I experienced one of the exclusive opportunities from the MasterCard Priceless website. As I previously mentioned, it is a VIP package for the Saks windows unveiling celebration. This offer and many others with themes in entertainment, dining, sports, travel and culture are available to all MasterCard holders. The world is your oyster, and this site is a great way to facilitate many bucket list items. Seize the day (or night)! Now, let’s talk about my very own priceless experience. First, there were only five available offers for this experience, making it super exclusive and highly covetable. Then, the offer included a personal shopping experience with a Saks stylist and a $250 gift card. So, not only did I get admission to VIP event, but I get to shop with consultation on the side. What a treat! My evening began with a mini-tour of the Saks department store with my stylist, stopping by the swim section to browse. (I’m leaving for Hawaii next week and wanted to shop for more options.) There was a reserved dressing room for me to try on my selections. Afterwards, I was escorted to Cafe SFA, on the eighth floor, where I met up with my boyfriend to begin the night. We sipped on some bubbly and nibbled on the passed hors d’oeuvres. When it was time to head outside, we were escorted to our seats across from the Saks building to watch the show. Since it was pretty cold outside, they provided us with hot chocolate and a blanket. After we snugly tucked ourselves in, the show began with special performances by Grammy Award-winning violinist, Joshua Bell, singer Frankie Morena and the Young People’s Chorus of New York City. Of course, my favorite part had to be the ballet dance by the Jacqueline Onassis School with snow flurrying down on us. 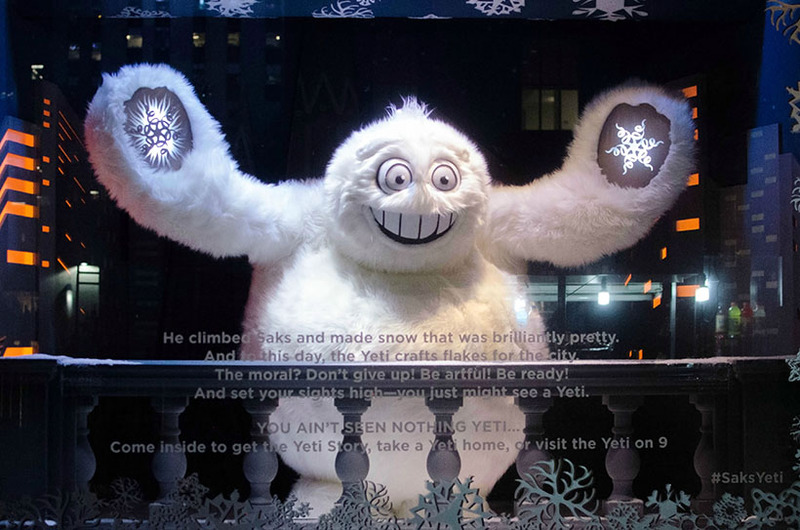 As the windows unveiled, the iconic event ended with an out-of-the-world projection onto the Saks building with the Saks Yeti making its appearance. Andy and I made our way back inside to warm up and watch 3D snowflakes get printed. After the crowd around the windows subsided, we went back outside to view the six Yeti-themed scenarios. Hi there! All cozied up. A magical moment. Snow flurries & graceful ballerinas. The windows are now unveiled! The Saks Yeti came out to make it snow. Part of An epic projection onto the Saks building. Fitting room diaries. Looking at swim. How awesome is 3D printing? I ended up getting my boyfriend a cute new tie and a lacey sweater for myself! Thanks so much to MasterCard for an unforgettable experience with Saks Fifth Avenue. I’m full of holiday spirit, and there was not a better way to kick off the season than this night. If you live in the New York metro area or visiting before December 24th, you can get a 3D-printed snowflake at Saks when you spend over $150 and take a piece of the holiday window decor home. P. S. For 2014, there is a MasterCard Priceless shopping experience in Paris complete with a tour of the Louvre, a photo shoot, luxury accommodations and fine dining! Keep up with all the new opportunities (they tend to sell out fast) from MasterCard on Twitter: @Priceless and @MasterCard #Priceless #MC.